Phycocharax rasbora, paratype pair with male above, photographed immediately after collection in a remote area of Mato Grosso State, in the Amazon River watershed of Brazil. With countless aquatic species awaiting discovery in the backwaters of Amazonia, only a select few will ever capture the attention of the aquarium world. Those that instantly catch the eye of humans are informally classified as “charismatic”—a hard to define quality that may be driven by pigmentation, form, behaviors, and personality. 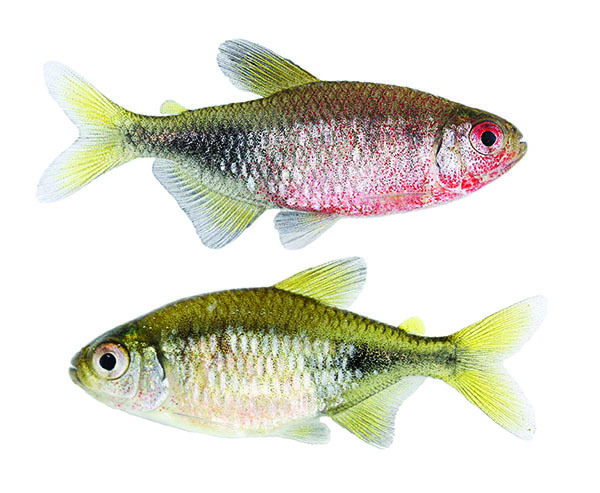 In the case of Phycocharax rasbora, it is readily apparent in its vivid hues, flashy presence, and the promise of being a sociable community fish. Growing to about 1.25 inches (30 mm), the previously unknown tetra reportedly thrives in a blackwater environment with a diet composed primarily of green matter. Etymology: From the Greek phykos, meaning “algae,” in allusion to the feeding habit of the new taxon owing to the dominance of this resource in its stomach contents, plus charax, meaning “pointed stake” or “palisade of pointed sticks,” the first generic name in Characidae. Gender masculine. 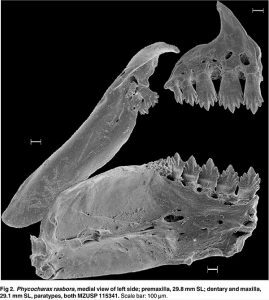 Phycocharax rasbora oral structure showing distinctive arrangement of teeth. Phycocharax rasbora was collected primarily in dammed portions of the Rio Braco Norte. In contrast with other tributaries of the Rio Tapajos basin, which are primarily clearwater rivers, the Rio Braco Norte is a blackwater tributary of the Rio Teles Pires. In the site of occurrence of P. rasbora, a small hydroelectric dam had been built (PCH Braco Norte IV), and apparently the reservoir conditions promoted the proliferation of algae. As a consequence of the damming, the species thrived and can be considered highly abundant at the dammed portion of the rio Braco Norte. In addition, P. rasbora seems to be uncommon in the lotic stretch of Rio Braco Norte downstream of the dam, where only three specimens were collected. 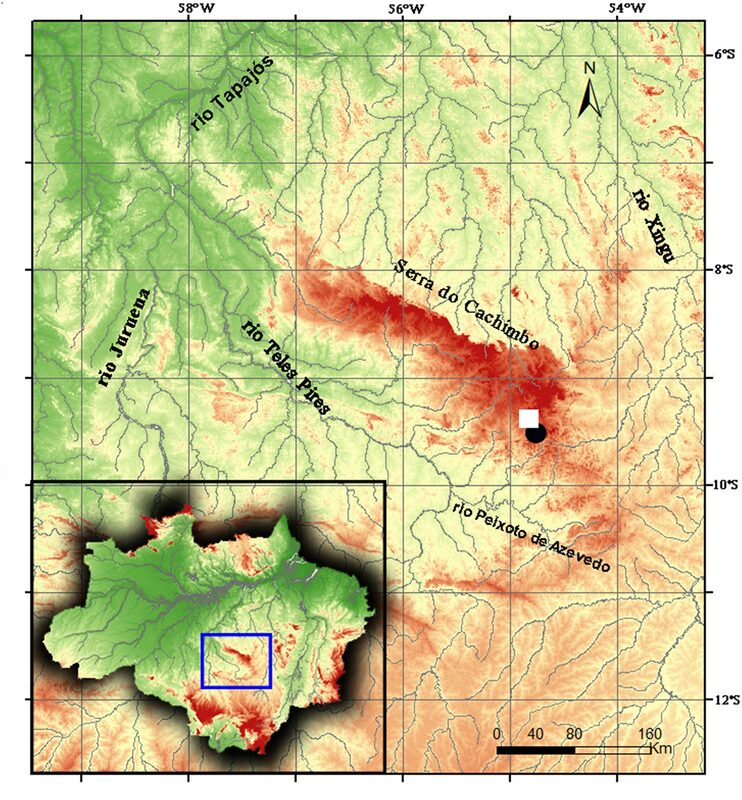 The type locality of the P. rasbora, the igarape do Arnaldo, is a small tributary which was flooded during the damming of the river, presenting muddy substrate with a great amount of decomposed organic matter with undergrowth marginal vegetation formed by grasses (Fig 4). 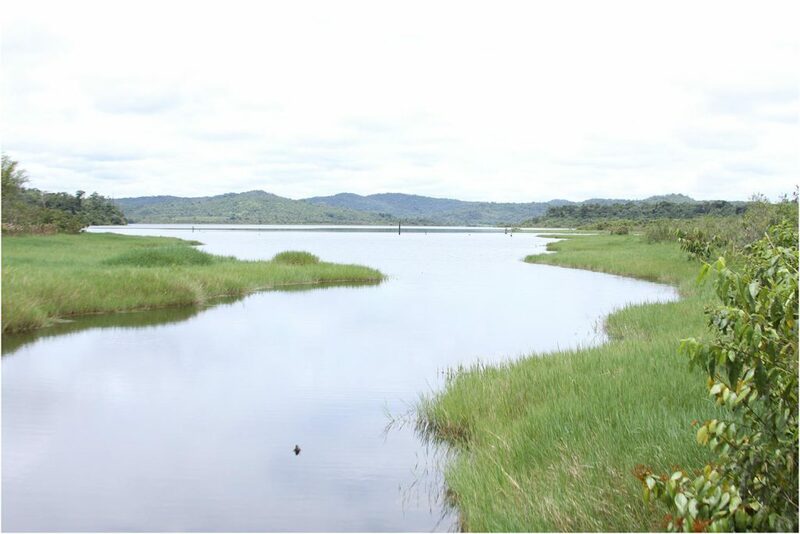 In this area, Phycocharax rasbora was the most abundant species, with 77% of all specimens collected. The section of the rio BracËo Norte downstream from the dam presents a sandy bottom with pebbles and rocks. Phycocharax rasbora occurs syntopically at Braco Norte reservoir with other Characiformes species, such as Cyphocharax cf. spilurus (Curimatidae), Leporinus friderici (Anostomidae), Serrapinus aff. micropterus, Astyanax aff. bimaculatus (Characidae), Hoplerythrinus unitaeniatus (Erythrinidae), Gymnotiformes, as Gymnotus diamantinensis (Gymnotidae), and Cichliformes, i.e., Aequidens sp. and Apistogramma sp. (Cichlidae). Unfortunately, the likelihood of the confusingly named “Rasbora Tetra” reaching the aquarium trade is uncertain at this point. Stephan M. Tanner, an AMAZONAS editor and breeder who is familiar with the export trade in Latin America says, “The question is: ‘Will any collectors go all the way out there? It is pretty off the beaten track of the aquarium trade in Brazil. However, this would be a good species for a small breeder, if a few specimens can make it into the trade, as I cannot see any regular volume of wild-caught imports from there, though.” Tanner located the likely area where the fish were collected on Google Earth and it can be explored here: https://www.google.com/maps/@-9.7704981,-54.9934719,3907m/data=!3m1!1e3?hl=en . 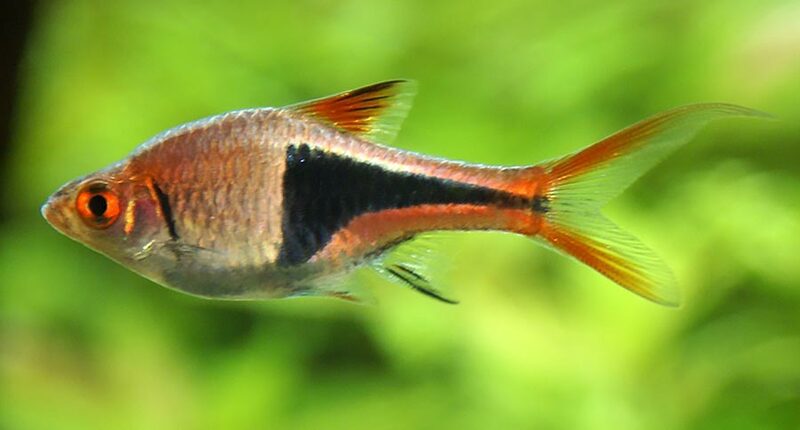 The species epithet “rasbora” was given to this new species of tetra due to the passing similarity of patterning to the familiar Harlequin Rasbora, Trigonostigma heteromorpha. Another look at the holotypes and paratypes easily reveals the similarity. For a quick comparison, here’s the Harlequin Rasbora (Trigonostigma heteromorpha). The authors are Willian Massaharu Ohara, Juan Marcos Mirande, and Flávio Cesar Thadeo de Lima, and the paper is published in the journal PLoS ONE, “Phycocharax rasbora, a new genus and species of Brazilian tetra (Characiformes: Characidae) from Serra do Cachimbo, rio Tapajós basin.” The paper presents this gorgeous, sexually-dichromatic/sexually-dimorphic species of tetra, discovered in the Rio Tapajós river basin. Copies of the paper may be downloaded free of charge. 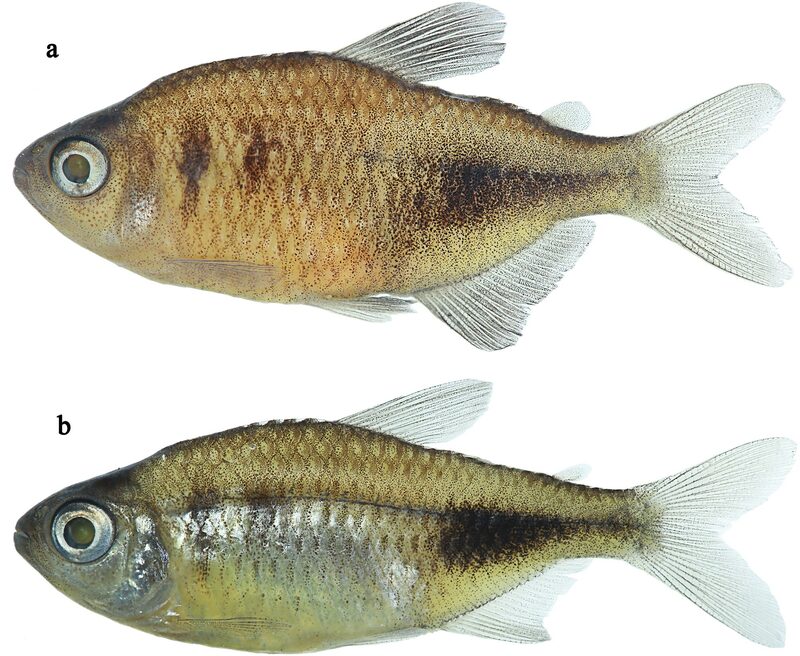 The full species description for Phycocharax rasbora, including discussion supporting the erection of a new genus for this species, is freely available freely via PLoS ONE. Read and download it here. 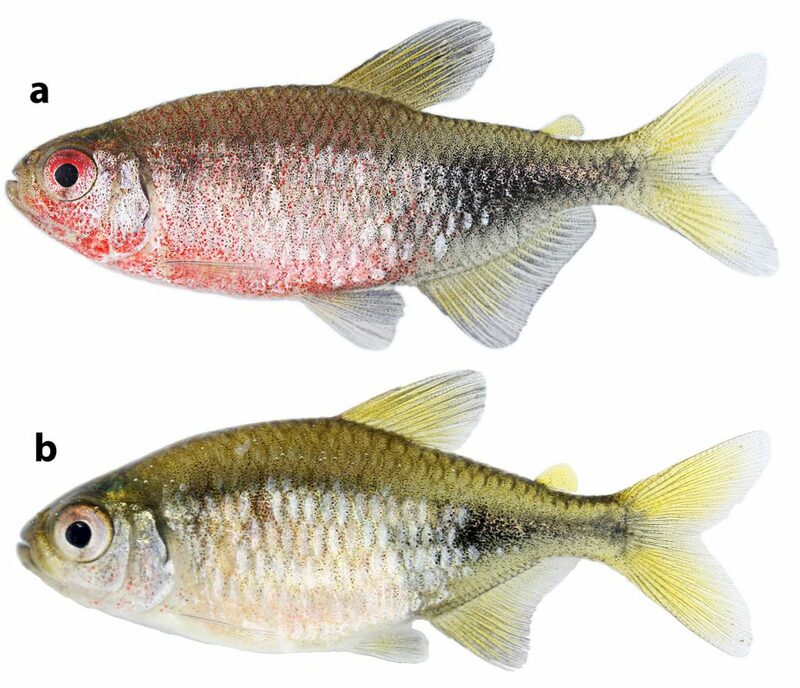 Phycocharax rasbora, A New Genus and Species of Brazilian Tetra (Characiformes: Characidae) from Serra do Cachimbo, Rio Tapajós Basin. how do you know which is female an male of the harlequin rasbora?? I just got 4 of them in different sizes. how do you know which is female an male of the harlequin rasbora?? I just got 4 of them in different sizes.